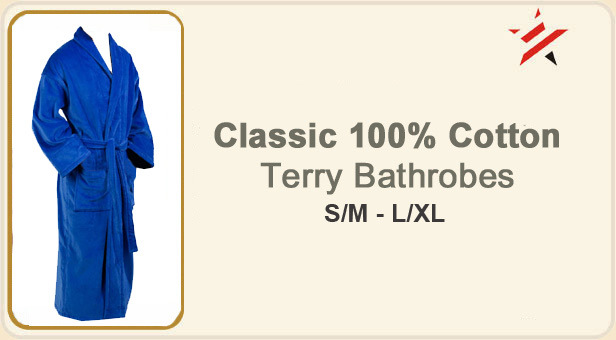 Another new colour added to our collection is the vibrant royal blue colour bath robe which is made from soft terry towelling fabrication with a very comfortable and sung feel. The 100% cotton fabric loops are perfect not just for comfort but it also absorbs all the water. This product comes in a range of sizes with a belt, front 2 pockets and shawl style fitting. Its ideal to have your logo embroidered on them. For bulk orders contact us for better rates on these royal blue bathrobes. If you are looking for a superman blue colour then we have this classic royal blue colour gown which is made from 100% soft cotton and is ideal for all kind of custom logo embroidery. It comes with front 2 pockets and belt and perfect for all daily use.